Prior to the weekend storm events that rolled across northern Illinois, tremendous progress was made in planting the 2015 corn crop. Planters were running late into the night despite temperatures that stayed near or slightly below seasonal averages for most of the week. Statewide, NASS reported that corn planting advanced 38% in the week ending May 3rd. 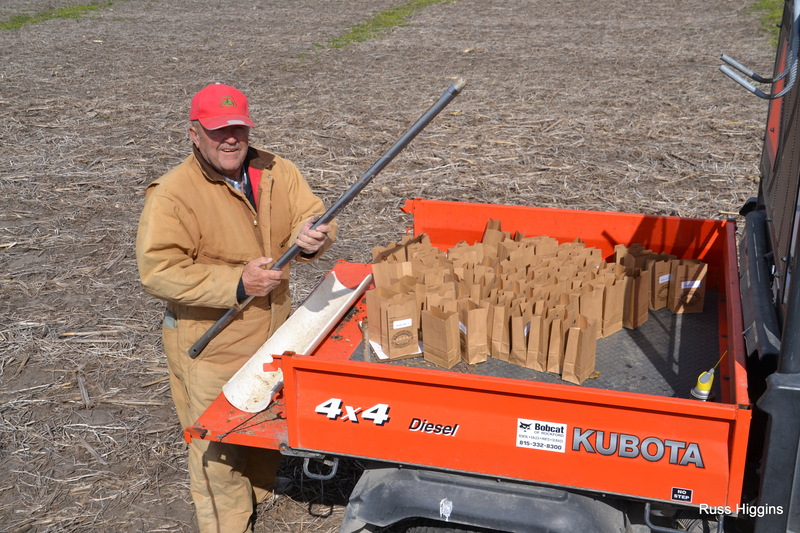 In addition to planting corn and soybean plots at the NIARC we collected one, two and three foot (depth) soil samples in our cover crop study to quantify the cover crops ability to assimilate and recycle nutrients. Thanks to Keith Jordal and Daryle Wragge who volunteered to join Kevin Vincent and I for the soil collection project. While most were busy planting corn with plans to apply soil residual herbicides prior to emergence, current precipitation totals may interfere with those plans. Dr. Aaron Hager reminded farmers to be cautious when applying soil residual herbicides to emerged corn. He shared that most, but not all, soil residual herbicides can be applied after corn has emerged. Products such as Balance Pro, Radius, Fierce, Prequel, Sharpen and Verdict must be applied before corn begins to emerge; applications of these products to emerged corn can result in significant corn injury. Dr. Hager also encouraged farmers to be cautious about applying a soil-residual herbicide in UAN carrier if corn has emerged as this can increase the potential for corn injury. Also, be sure to consult the respective product label for tankmix and spray additive recommendations or prohibitions.